Wow, this is my 5th year as a Virtual Advent participant! I'm so glad Marg and Kelly keep organizing it every year. It helps get me in the holiday spirit! It's the first weekend in December. Are you decking the halls? Are you setting up your tree or your lights? Maybe you've been thinking about it and need a little push to get you going. Like the people in this photo, my Grandmother is Danish. She immigrated to Canada when she was quite young. As a child, every Christmas Eve the grown-ups would sneak a Christmas tree into the house, decorate it with lit candles, flags and homemade ornaments, then reveal it to the children. It was a sort of surprise to get the children excited. The surprise Christmas tree fell out of favour, as well as the lit candles, but flags and homemade ornaments continued to grace her tree. Over the last few years, I've tried to make at least one ornament for our tree. This decoupaged ornament is this year's addition. For the little kids, this free Santa's Beard Advent Calendar from Inviting Printables is really cute. Just stick it up on the fridge and everyday glue a cotton ball to Santa's face. After you have the house tinselfied, sit back with a hot cocoa or, my fave, a coffee with eggnog. Put up your feet and play a little Sarah McLachlan. And of course you need something Christmasy to read. Here's a story from L.M. Montgomery, a story about decking the halls and ending a feud. I hope this is the start of a fun filled month for you! Please check out all the stops on the Virtual Advent Tour, including my tour partners for the day Alex, Amy, Charlotte, and Angel . Thanks for the ornament making idea! We will try it out. Thanks for this lovely post. Great ideas! It's even getting me in the Christmas mood. Your ornament is lovely! I love handmade ornaments and ornaments that have special meaning. Thanks for helping me get into the spirit, as it's been difficult for me this year. Oh, I like that ornament. I used to make Christmas tree ornaments. One year for Christmas I got creative and made a whole bunch for my grandfather. I need to get back into being creative... Thanks for joining in once again this year! OMG! That's absolutely awesome! Thank you for sharing the directions! Making you own ornaments sounds appealing. Thanks for sharing the instructions! 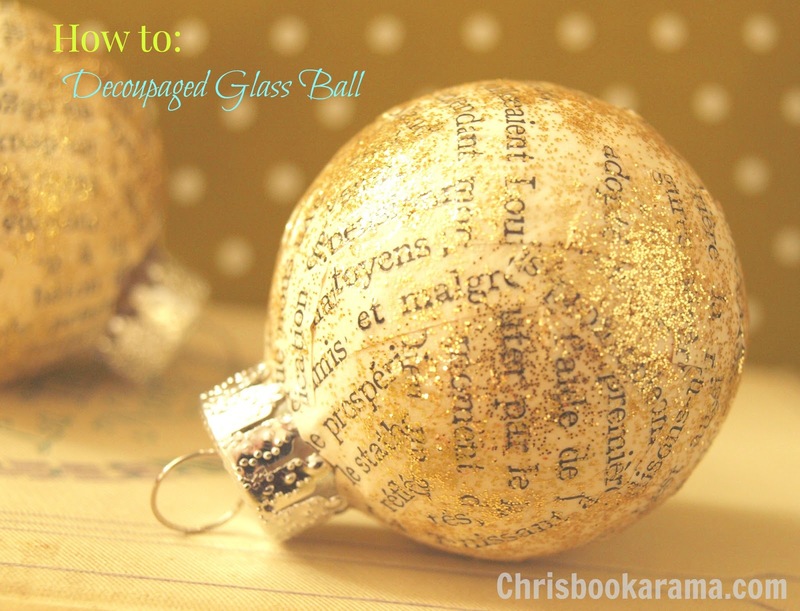 I love the decoupage Christmas balls! They look lovely. Also, thank you for linking up to the advent calendar. What a fun idea! Thanks for the great ideas! The decoupaged Christmass bauble is lovely and the Santa's beard calender is really cute. I love love love the decoupages Christmas ornament. Also a fan of the Santa Clause calendar. Maybe when Greyson is a little older and doesn't want to pull off the cotton balls. Your sparkly ornament is just beautiful, complete with directions, thanks!, and the Santa cotton ball calendar is too fun. I'll have to use it next year with my class. Merry Christmas! Isn't it fun to celebrate with this tour?! I love Sarah McLachlan's Christmas album! Wintersong and her version of River are my favorite. Thanks for sharing your family's Danish traditions! I think it is neat you try to make an ornament a year! I like this year's and it does sound relatively easy to make too! Thanks for the instructions on how to do so!! I often wondered about trees with lighted candles on them. To me they sounded a bit dangerous, but I guess people just did what they had to work with and did the best they could with it! This ornament is gorgeous Chris, thanks so much for the instructions maybe I'll try to be crafty and make one myself. Love the post. Some really great ideas. I have been sipping on eggnog for a few days now, so delicious. What is Mod Podge? I love your ornament, and think it might be something my daughter and I can do next year, if we can find an unbreakable ball - our cats tackle the tree on a regular basis while it's up, so only unbreakable items are on it now. Thanks so much for sharing! You make it sound so easy that even uncrafty I want to try it! Is Modge Podge just craft glue? Your ornament is awesome! Glitter does have a tendency to go everywhere and stay everywhere doesn't it! Thanks once again for your continued participation in the tour! See you on the tour again next year! Amy & Betty- lol! Definitely. When I heard the story, I asked my Mom about the candles. She said they would only light them for a moment and then blow them out. Like Birthday candles I guess! Susan- Mod Podge is a glue and sealer. It's used for sealing puzzles. You can get it in the craft section of Walmart. Marg- It is a craft glue but a sealer too. I'm not sure how regular craft glue would work. If it dries hard and clear, it would do the same job. Booksync- That album is great for quiet moments. Thanks everyone for your comments. I'm glad to help get you into the spirit. That is so pretty! Where does one find Martha Stewart glitter? Thanks for the tip, I'll probably do it with my little cousins. I'm sure they'll love to be covered in glitter! Wow -- I'm of Danish heritage too and that is the theme of my Advent post! I forgot I had Sarah McLachlan's Christmas CD -- I've been too busy grooving to Michael Buble's. Must dig that one out though. Great post and Merry Christmas. Ohhhh!! That is SUCH a pretty ornament! I love it! Bookfool- I found it at Michaels but Walmart sells it too. I love the ornament idea. My tree is already up and fully decorated, but I think this will make excellent gifts for my book club. Such a fun post! The decoupaged ornament is lovely!